Soils Tips for Santa Barbara Gardens | Landcaping Tips | Down to Earth Landscaping Inc.
Have you ever wondered about the soil type you have on your property? In Santa Barbara, we run into 4 varieties of soil types. In our last blog, we offered some secrets to planting a low maintenance garden. In the course of writing this blog, we realized that an examination of Santa Barbara’s soil types themselves would be helpful because each soil type needs to be treated and amended in a different way. This soil is most often found in the foothills of Santa Barbara County. It consists of a chalky substance that has been compressed over thousands of years. The soil is generally white or light grey in color that is actually useful as chalk. It is mainly found on slopes and hillsides, not in a flat area. There isn’t much you can do to improve Monterey Shale soil. My best tip would be to dig down and see if you have better soil underneath. If not, you will need to dig the shale out and then bring in new topsoil. There are two different kinds of clay soil found in Santa Barbara. They are the yellow clay of the Mesa and the black clay of the lower Riviera Clay is a soil type composed of very fine particles, usually minerals like silicates of aluminum, iron, and magnesium. Clay particles are smaller than 0.002mm. It is classified as having a very large specific surface area, which impedes the flow of water. This means that it will hold water for a long time. When wet, it is heavy and gummy. When it’s dry, it shrinks and settles. The most effective method of improving the growing properties of clay soil is to use organic matter as a soil amendment. Gypsum—a common mineral, hydrated calcium sulfate, CaSO 4 ⋅2H 2 O. It occurs naturally in crystals and in masses, soft enough to be scratched by the fingernail—can improve the physical condition by providing enough electrolytes. This gives clay soil greater water infiltration and is less subject to erosion than untreated soils. Organic matter encourages earthworm activity and protects aggregates from beating rain and solar radiation. Organic matter may include the addition of crop residues, composts, and manures. All are necessary for planting in clay soil. This is a soil in which sand predominates. It is generally found in the coastal areas of Santa Barbara. Sandy soils are coarse in texture. Some plants and trees love growing in sandy soils, but others can’t tolerate it. Because of the large size of sand particles, sand has a relatively low specific surface area. As mentioned above, some plants prefer growing in a sandy soil. These plants will usually have roots that penetrate deeply to find waterway beneath the surface. Other types of plants don’t have this ability and sandy soil will have to be improved to grow them. Sandy soils can be enormously improved by the generous addition of organic matter such as mushroom compost, composted manure, or peatmoss. Spread a layer of organic matter 3 to 4 inches (7 to 10cm) thick on the surface of the area to be improved, and then thoroughly incorporate into the soil. Keep in mind that excessive amounts of manure, especially if fresh, can raise nutrient and salt levels to a degree that may be toxic and therefore restrict plant growth. Often found in the downtown areas of Santa Barbara, sandy loam soil is described by textures and classified by the fractions of sand, silt, and clay. This soil is intermediate in texture. 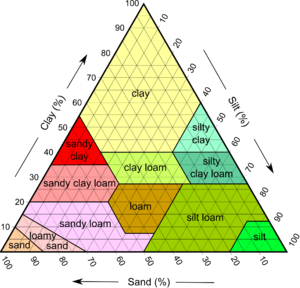 Loam is the concentration of the sand, silt, and clay. It is relatively equal in proportions with soil components. Sandy loam soil is referred to as “select fill” due to the compaction capabilities and stability. If you have sandy loam soil, you are one lucky homeowner. This kind of soil needs very little in the way of amendment before planting. In Santa Barbara, we treat sandy loam with proper additional organic matter consisting of manures of aged steer, chicken, and bat waste. It is also necessary to old alfalfa meal, cottonseed meal, and bone and blood. More questions on regarding your soil? Schedule an appointment with us today!